Belt Conveyors from LVP Conveyor Systems Ltd. are an ideal materials handling solution for goods with irregular surfaces and are therefore not suitable for roller conveyors. Products can be conveyed directly on to the belt so both regular and irregular shaped objects, large or small, light and heavy, can be transported successfully. Different industries require different belting, and our range covers PU belts, modular belts, slat chain, flexible chain and wire belting. LVP Conveyor Systems Ltd. can handle all of your belt conveyor needs, and can supply our belt conveyors in mild steel, aluminium and stainless steel frames. 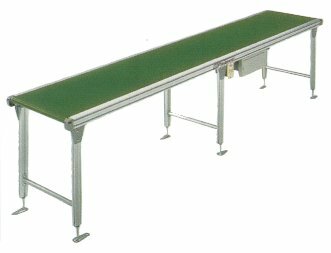 Please contact LVP Conveyor Systems Ltd. on sales@conveyors.ie for more information or click on the images below to view more models within this section. 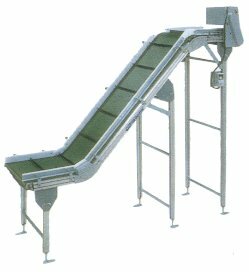 The Belcon Mini Series is comprised of compact and easy-to-carry mini-belt conveyors. The series is ideal for conveying between processes, also can be used in an assembly line as a feeder or as an optional conveyor for the mechanical equipment. A guideline for transfer capacity is 10 kg / unit. Jabucon series: Smart, clean and waterproof. 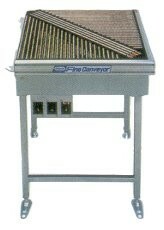 Jabucon conveyors have an all-stainless body, and a drive section protected by a cover. 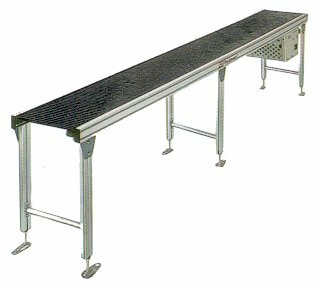 The conveyor body can be rinsed with water to wash off fouling by cargo, so this conveyor is perfect for industries like food, agriculture, marine products and chemicals. JMS Knife Edge Type Conveyor The Jabucon Series is ideal for the Food Processing, Pharmaceutical, Chemical, Health Care, Agriculture and Fish Industries, where hygiene standards are of paramount importance. The main body is constructed of stainless steel and the drive section is protected by a waterproof cover. The electrics conform with IP65 Standards. The Jabucon Series is available in a variety of models including incline, knife edge, troughing, and curved conveyors. JCB Curved Belt Type Conveyer The Jabucon Series is ideal for the Food Processing, Pharmaceutical, Chemical, Health Care, Agriculture and Fish Industries, where hygiene standards are of paramount importance. The main body is constructed of stainless steel and the drive section is protected by a waterproof cover. The electrics conform with IP65 Standards. The Jabucon Series is available in a variety of models including incline, knife edge, troughing, and curved conveyors. JBM JBM Standard Type conveyor The Jabucon Series is ideal for the Food Processing, Pharmaceutical, Chemical, Health Care, Agriculture and Fish Industries, where hygiene standards are of paramount importance. The main body is constructed of stainless steel and the drive section is protected by a waterproof cover. The electrics conform with IP65 Standards. The Jabucon Series is available in a variety of models including incline, knife edge, troughing, and curved conveyors. JMK Cleated Type Conveyor The Jabucon Series is ideal for the Food Processing, Pharmaceutical, Chemical, Health Care, Agriculture and Fish Industries, where hygiene standards are of paramount importance. The main body is constructed of stainless steel and the drive section is protected by a waterproof cover. The electrics conform with IP65 Standards. The Jabucon Series is available in a variety of models including incline, knife edge, troughing, and curved conveyors. Fine Conveyors create clean environment for meeting the needs of our time. 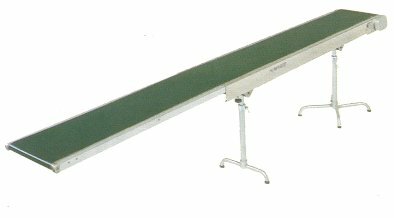 These high-quality conveyors are built from aluminium, stainless steel and resin parts. They are at work in all kinds of processes, including assembly, inspection and packaging. A guideline for transfer capacity is 20 kg / unit. Belt Driven Conveyors the cost effective solution for transporting unit loads. LVP Conveyor Systems Ltd. range of powered belt conveyors is designed for applications where improved load control and speed of operation are important factors. They are particularly useful when a conveyor is required to carry fragile loads or a wide range of load weights or sizes. Centre Driven belt speeds 9, 14, 18, 24 and 30m per minute. End Driven by a motorised drum, belt Speeds – 15.6, 18.6 and 21 .6m per minute – up to 10m long. Robust and durable 2-ply transmission belt. Mezzanine (Incline/Decline) Belt Conveyor: Inclined belt conveyors are used to deliver packages or boxes from one floor to another and when fitted with a reversing control can operate in either direction. They can be used as stand alone units or as integrated elements of a conveyor system. Robust and durable 2-ply feeder transmission belt and gripface incline belt. 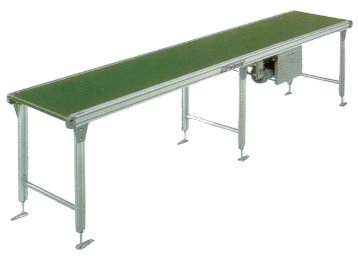 Drum Driven Belt Conveyor: Drum driven belt conveyors are for the horizontal transportation of items and assembly line operations. They are available in lengths from 2m up to 30m in 0.5m increments. They are constructed using cold formed steel and powder coated channels. Waste Belt Conveyor Waste belt conveyors are for the horizontal transportation of cardboard and paper waste on assembly line operations. They are available in lengths from 2m up to 30m in 0.5m increments. They are constructed using cold formed steel and powder coated channels. Heavy Duty Belt Conveyors are high speed and robust with minimal maintenance. 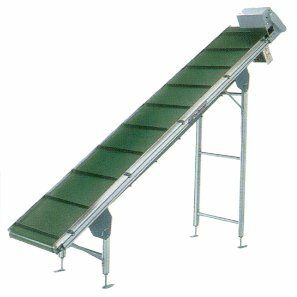 These conveyors are available in powdered coated mild steel and stainless steel. The Heavy Duty Belt Conveyor is a robustly engineered product, that operates quietly and requires minimal maintenance. It has a high throughput capability and a durable design. The Heavy Duty Belt is a quiet conveyor, with a noise level of 6ldBa*, 10-15% quieter than comparable belt conveyors. Nose Over Unit is available in certain fixed angles. Ranging from 2.5 – 28 degrees. Available for belt widths 600, 700, 800, 900, 1000, 1100 and 1200mm belt width.